For the analysis of September new car registrations, we wanted to take a closer look at one of the markets outside the well-known EU-5 region. Our choice fell on one of the Scandinavian countries: Norway. 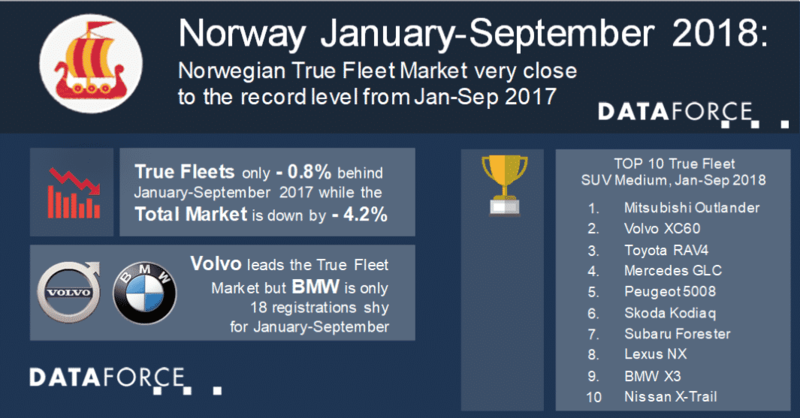 2017 was the best year so far for the Norwegian car market and 2018 is not very far behind this record level with a drop of only 4.2% year-to-date. And while the Private registrations fell by 8.3%, True Fleets were only a little less than 400 registrations short from January until September 2017 (- 0.8%). The volume for Short-Term Rentals was extraordinary stable with only 9 units less when compared to the first nine months of the previous year. Beside Sweden Norway is the only country where the top 10 ranking for True Fleets is led by Volvo. With a more than solid + 17.1% the manufacturer from Gothenburg gained three positions followed by BMW, Toyota, Volkswagen and Mercedes. However, the biggest volume increase within even the top 20 brands was achieved by Nissan (6th, + 34.7%). This push was mainly caused by the Leaf with additional support from the SUV X-Trail and the passenger car versions of the utilities NV200 and NV300 respectively. Ford and Škoda on ranks number 7 and 8 both lost one position while Mitsubishi had a very positive year so far (+ 13.3% thanks to the Outlander and the all new Eclipse Cross) and took the last spot in the top 10 behind Peugeot. Norway is certainly a very interesting fleet market. Did you know that the share of the SUV Medium segment there is the highest across the whole of Europe? Almost 15% of all company cars belong to this group with the models Mitsubishi Outlander, Volvo XC60 and Toyota RAV4 on the podium. And obviously a lot of manufacturers were able to participate in this positive trend as we saw ten different OEMs in the top 10 models! But beside the appetite for SUV, Norway is also known for its exceptional fuel type mix. For January until September the share of the alternative fuels accounted to 51.3%. That is no less than sevenfold the value for the EU-5 region! While CNG and LPG don’t play a role the share of Hybrids (36.0%) has become higher than the ones for Petrol (27.0%) and Diesel (21.6%). And the full EVs? 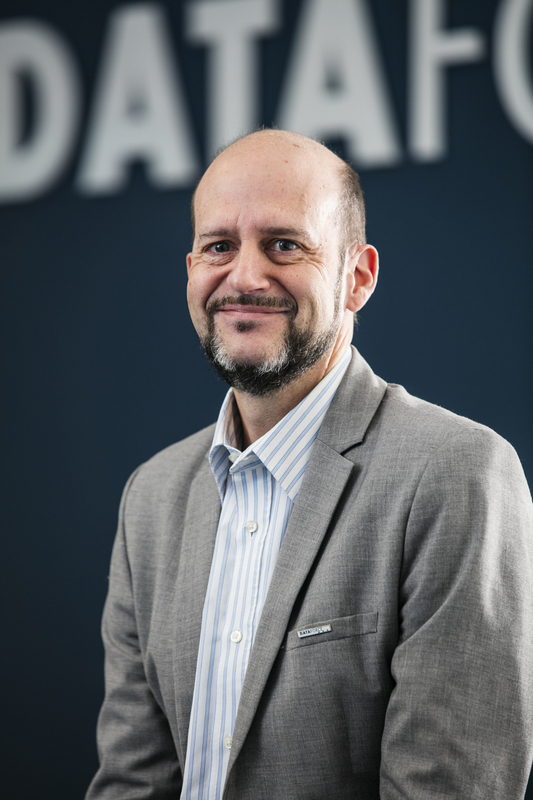 Their slice of the market is now 15.4% and more than double the height seen in the Netherlands, the second strongest nation in terms of EV share in Europe. Impressive. This of course also reflects in the model ranking. For the first nine months of 2018 the full electric Nissan Leaf was number one in fleets, followed by the Mitsubishi Outlander PHEV and the Volkswagen Golf (70% thereof is a GTE or E-Golf) with the next full EV, BMW’s i3, ranking 4th overall. The models on ranks number five to ten (Volvo V90 and XC60, Toyota Yaris, Volkswagen Passat, Toyota RAV4 and Mercedes GLC) all had a Hybrid share of at least 70%, three of them even above 90%. Pretty amazing figures compared to other European countries, don’t you think?